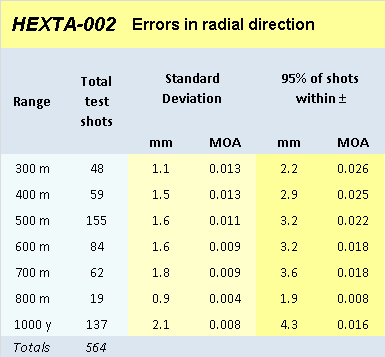 We are pleased to publish a summary of recent accuracy test data for the HEXTA-002 electronic target. The tests were performed by HEX Systems between August 2013 and January 2014 on properly maintained targets. We encourage users to implement a regime of ongoing testing to ensure their targets always perform to the highest level of accuracy. Proper maintenance is also essential. 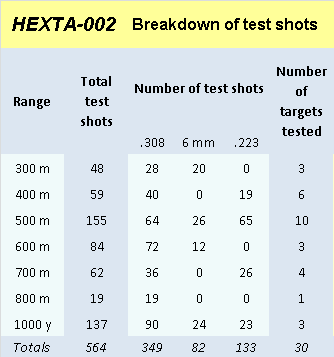 Here is a breakdown of the test shots showing calibres used, number of targets tested, and range distances used. We prefer to present results in terms of radial error (in the radial direction, like the sun’s rays) because it is the radial component of the errors that affect scores. The error is expressed in terms of standard deviation, in mm and in MOA (minutes of arc). Approximately 2/3 of shots would be expected to have an error within one standard deviation. By doubling the standard deviation we can estimate the error that 95% of shots would be expected to fall within. Alternatively, the results may be expressed as errors in x and y directions, or as absolute linear errors. These are presented below. 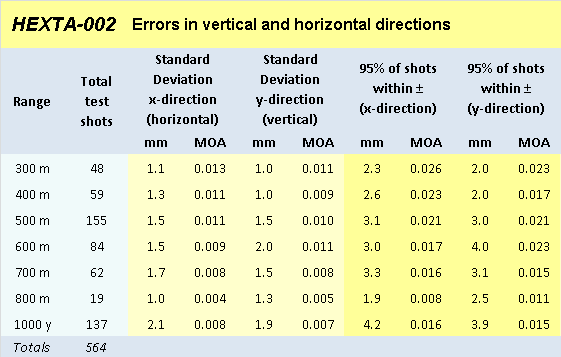 Here are the HEXTA-002 error results, expressed as x-direction (horizontal) and y-direction (vertical) components. 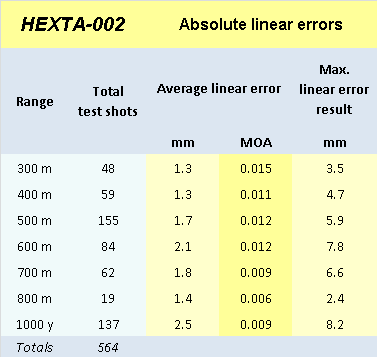 Here are the HEXTA-002 error results, expressed as absolute linear errors. The maximum error result for each range is also shown.